Da Bears Blog | How Inconsistent was Chicago’s 2017 Ground Game? In terms of rushing yardage per game, the Bears were the least consistent team in the NFL by a wide margin. The table below shows the game-by-game standard deviation for all 32 NFL teams in 2017, with the Bears shown in orange. That dot way off on the right is the Bears. Their standard deviation for single game rushing totals was 79.2, while the next highest was the Jets at 66.3 and the NFL average was 45.5. The Bears are so far removed from the rest of the sample that they can statistically be considered an outlier, meaning you would exclude that data point from any further statistical analysis because it is too far from the rest of the group to be considered relevant. It’s worth noting that consistent does not necessarily mean good, as the five most consistent teams featured awful rushing attacks from teams like Detroit, Indianapolis, Tampa Bay, and Miami. Being consistently bad is not something to strive for, but the best rushing attacks should be consistently good instead of showing just flashes of brilliance while getting absolutely shut down at other times. 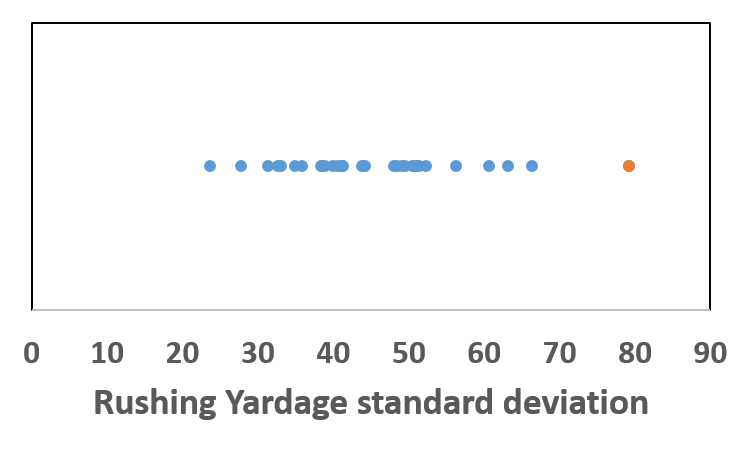 Of course, variation in rushing yardage in a game can simply be due to the circumstances of the game; when teams are trailing late they are forced to stop running in order to catch up. So another way to look at how effective a team is running the ball is by measuring how many yards they average each time they carry it. The table below shows the game-by-game standard deviation for these results for all 32 NFL teams in 2017, with the Bears shown in orange (note I rounded to the nearest 0.1 yards, so there are only 11 different values here). Once again we see that the Bears are among the least consistent rushing teams in the NFL, though this time they’re not way out by themselves. The Bears had a standard deviation of 1.9, compared to an NFL average of 1.2 and a total range from 0.8 to 2.1. Chicago came in 2nd here, with the 3rd place team being a good bit lower (for these small numbers) at 1.7. One thing I found interesting here is that the least consistent rushing team by this measure was actually Kansas City, where new head coach Matt Nagy comes from. Of course, that is heavily skewed by one game when they ran it only 11 times and averaged 10.2 yards per carry thanks to one 70 yard run. 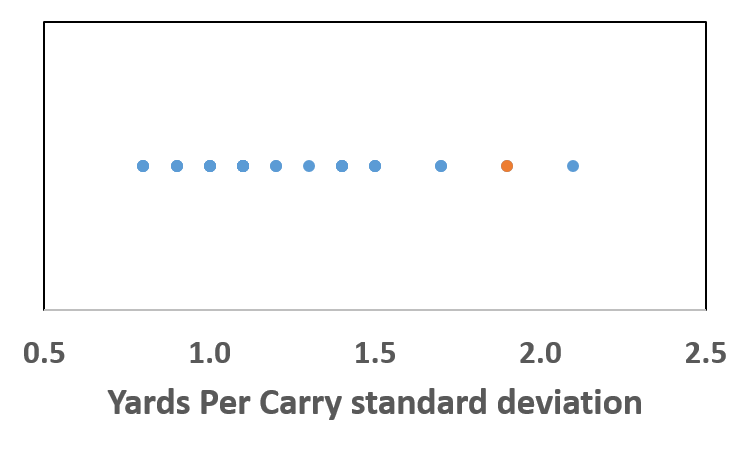 The small sample size of only 11 carries fails to even that out, resulting in a massive outlier that skews their overall data. If you remove that one game, they drop to a standard deviation of 1.6 (whereas removing Chicago’s high of 7.4 yards per carry drops them from 1.9 to 1.8). The Bears don’t quite fit the definition for an outlier here, which would be 2.0, but once again we see that they had a very inconsistent rushing attack. This isn’t any new information, but it’s good to see the numbers back up the eye test. I also went and looked at the Bears’ 2016 rushing data to see if 2017 was a new problem or continuation of a troubling trend. In 2016 they had standard deviations of 34.1 in terms of rushing yards per game and 1.0 for yards per carry from game to game, both of which were below average for NFL teams in 2017 (I didn’t do all the legwork for 2016 because that felt unnecessary). That indicates they were actually a fairly consistent rushing team in 2016, and the inconsistency that plagued them in 2017 is thus not a repeating problem. This is good to see, as it likely means that the consistency issues Chicago experienced running the ball in 2017 were due to a predictable offense. That’s good news for the Bears going forward, because a new offense will hopefully bring a more consistent rushing attack.